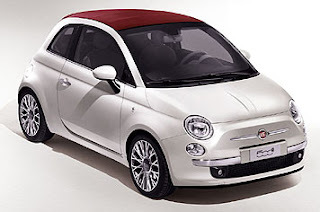 These are the first official pictures of the new Fiat 500C, due to be unveiled at the Geneva motorshow next month. The sardine tin-style folding roof has been designed to maximise the Fiat 500C boot space, as well as referencing its Topolino ancestor. That means the new Fiat 500C has the same 185 litre load space as the hatchback, and also ensures that changes to the structure of the 500 body are kept to a minimum, reducing production costs. The new Fiat 500C will come with the same line-up of three engines that's found in the 500 hatch and will be offered with the new ‘Start&Stop’ system as standard. Two new paint colours have been introduced - Pearl Red and Warm Grey - to compliment the ivory, red and black roof. Prices are expected to start at around £12,500, a £3,000 premium over the 500 1.2 Pop hatchback. The Fiat 500C goes on sale in May, just in time for Summer. A worldwide preview of the Fiat 500C presentation will take place at the next Geneva Motorshow, before its launch throughout Europe this Spring. Evocative of "freedom and emotion", this original 'cabriolet' pays homage to the open-top 1957 model whilst offering leading-edge solutions for mechanical units, powerplants and interior comfort. All this in authentic Fiat tradition giving access to higher segment engineering and technology hitherto unheard of. Featuring an innovative soft-top - a fully fledged window to the sky - the new 500C comes in the same size as the basic model (3.55 m x 1.65 m x 1.49 m) and the same three powerplants: the 1.3 litre 75bhp Multijet Turbodiesel coupled to a 5-speed manual transmission and the two 1.2 litre 69bhp and 1.4 litre 100bhp petrol engines, available with either manual or robotised Dualogic transmission. Providing different features, all three engine types are generously sized, have a brilliant temperament and offer high performance based on sophisticated technology. Standard features include stubborn reliability and environmental friendliness. Moreover, as proof of Fiat Automobiles commitment to ecology and sustainable mobility, the new 500C incorporates the innovative “Start&Stop” system, a device controlling momentary engine shutdown and subsequent reignition. To this end, at every stop when shifting to neutral and releasing the clutch, the engine is switched off and then restarted simply by selecting a gear. Created by the Fiat Styling Center and manufactured at the Tychy plant in Poland, the 500C is of the “open source” design, implying the addition of new functions to a highly successful existing product. 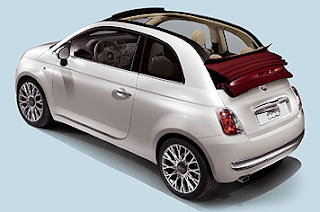 Indeed, the Fiat 500C incorporates all the strong points of the basic model, namely top-of-segment safety features, 4-adult seat habitability and generous luggage space combined with excellent load-ability also with the soft top fully open, thanks to a clever parallelogram hinge device. 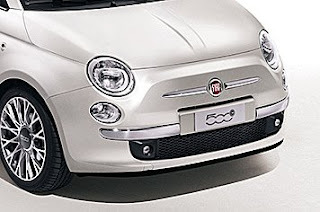 A highly original exercise in design, the soft-top of the Fiat 500C stands out for its refined electrically operated linkage and engineering solutions of great quality and finish, such as the glass backlight and the built-in center high mounted stop light. Available in three colors (ivory, red and black), this original soft top will be matched with several bodywork color schemes, two of which have been conceived specifically for the new car, i.e. a brilliant Pearl Red and a special Warm Grey typical of sports supercars. 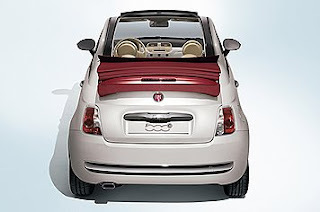 Last but not least, thanks to the adoption of the innovative sliding soft-top combined with a styling concept which retains all-round protection, the Fiat 500C offers a delightful ride in any season of the year. All told, its many special features make this new car one of the best turned out cabriolet models currently on offer in the city-car segment. The 500C is further proof of Fiat's undisputed leadership in this vehicle class where continuous innovation ensures that its position as the industry's standard is maintained. In fact the car sets new levels of in terms of comfort and safety, engineering and appointments whilst maintaining that unique and inimitable "Italian style". A new cabriolet is born which gives great excitement and utmost driving pleasure, combining captivating lines with the performance of flexible, environment-friendly engines.